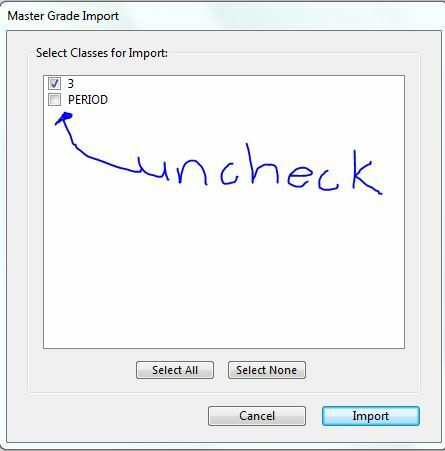 Thanks to the MyEdBC helpdesk, we have the “MasterGrade export” option now. 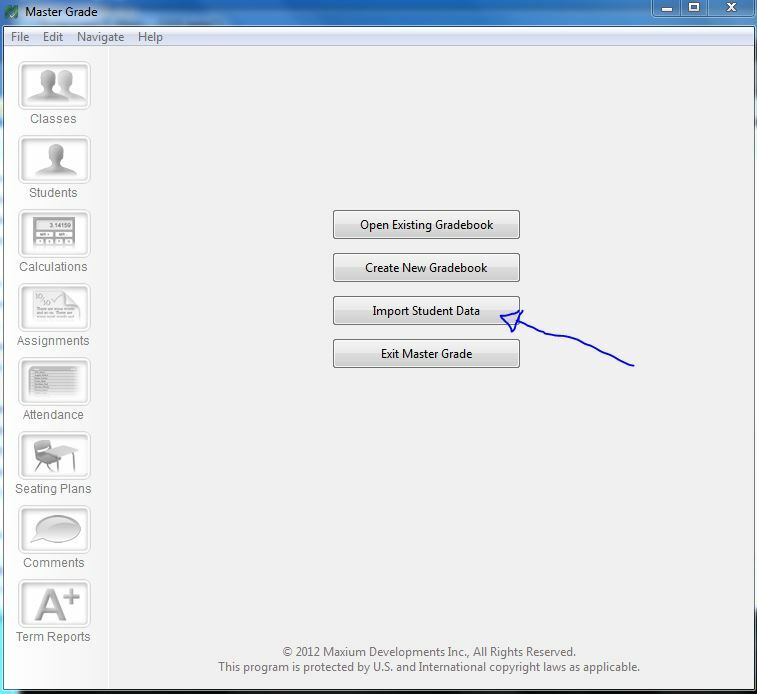 Please follow these instructions to export your class lists. This is far from a perfect option but it is the best we have at the moment. You will need to drag a “plugin” into the C:\Program Files (x87)\Master Grade\PlugIns folder for the import to work. 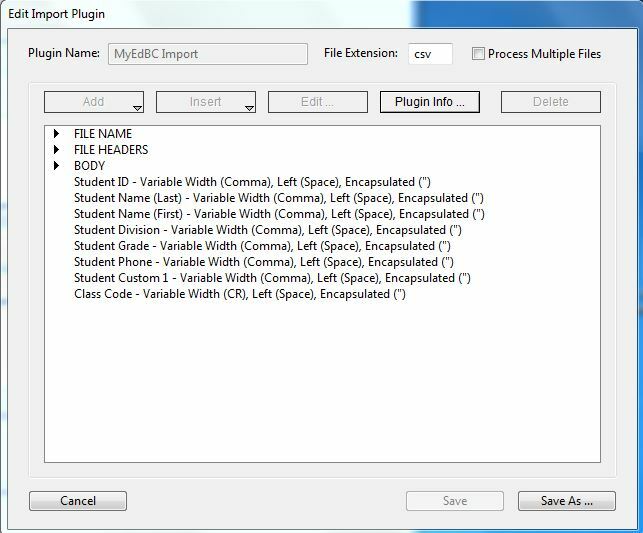 This is a modified plugin from Master Grade to get it to extract the information from a CSV file exported from MyEd. (For anyone curious, these are my plugin settings). Please note: on a School District computer you will likely need a Tech Facilitator to install the plugin for you as it requires admin access. 2. Select a class by clicking a check box and then click Roster on the left menu. 5. 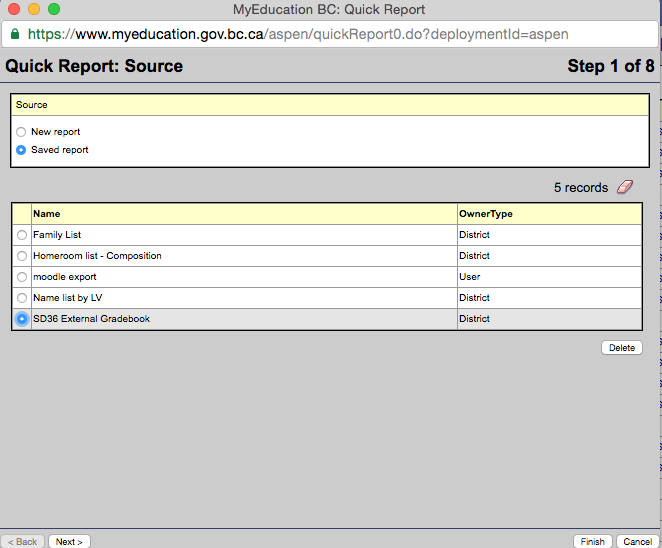 Once your quick report has run (you might have to enable pop-ups etc.) you need to save it (the resulting CSV file) to your computer. On Windows, you may have to press Ctl+S on the pop-up screen. 1. Open your CSV file in Microsoft Excel and create one more column at the end and call it “Period”. The number should correspond to your block order. For example, this is my Block C class so I called it period 3. 2. Make sure you have set the “Number” formatting to “Number” rather than “General” for this new column or you may get an error importing into Master Grade. The easiest way to do this is to click on the column letter (in this case “H”) and then choose the formatting from the menu above. 3. Save the file, making sure that it is still saved in the CSV format. 1. Open Master Grade (remember, for this step you need to have the plugin installed to C:\Program Files (x87)\Master Grade\PlugIns… you can download it at the top of the page in Step 1). 4. Click “Import” and voila! Your class list should be within Master Grade! I am hoping you can help me. I’ve followed along your instructions, but I have a MacBook Air, and I am trying to load the plugin “MyEdBC Import.imp” you created. When I double click on the file after downloading, it opens up MasterGrade automatically, but trips up by opening a MasterGrade dialogue box that reads “Opening Document…” and cannot proceed. You mention the path name “C:\Program Files (x87)\Master Grade\PlugIns” but what is the Mac equivalent? Good question, I’ve only tested this on Windows but I would think it would work on Mac as long as you drag that file into the plugin folder. Not sure where that is on Mac off the top of my head but I’ll take a look this week at school. I got as far as ‘saved report’ but there was no Master Grade section. I had a choice of 7 files compared to your 3 that you show. Is that a different page? 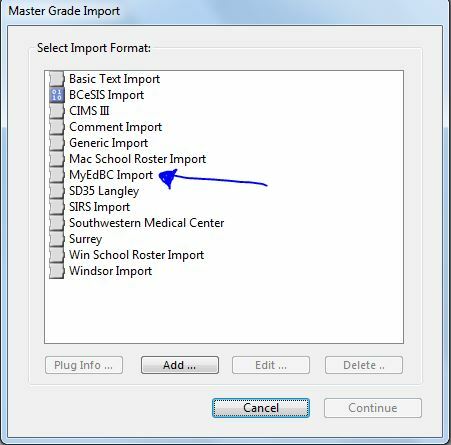 It appears MyEDBC has changed “MasterGrade Export” to “SD36 External Gradebook”. I’ve updated my post. Got it to work by changing the format of the “period” column from “General” to “Number” Yay!! Happy Days. Voila it works! Awesome! Glad you got it working. I will have to go back and double check my steps since MyEdBC has changed a few things since I did this last year. Thanks for providing your solution. Rereading your comment that makes sense that it wouldn’t work if it’s not set as a number. I’ll update my directions with that caveat. Nathanael, can you tell me what your column headings were for the CSV file?